Honda have followed up the success of the Amaze and the City by stepping into a wholly new segment, a place where they are absolute novices. The MPV market is going to be a tough segment to capture the attention of, especially since the choices offered by established players is immense. Yet in the last couple of years whatever Honda has touched has turned to gold, washed to a shiny lustre no thanks to diesel! Now they have the Mobilio, an MPV that is based on the Brio and Amaze, and we were there in Nasik to get a first drive impression of it. So to get straight to the point. exterior. Any other MPV when parked next to the Mobilio will look like a breadbox, so saying that the Mobilio looks impressive is saying a lot. It is in fact so impressive to look at, it shames the Amaze and the Brio, its respective sedan and hatchback siblings, all of which are progeny of the same seed. Part of those good looks comes from its enhanced length - whoever said good things come in small packages should stop smoking whatever it is they are smoking! Long is good, length has given more space for the Honda designers to play around with the lines and creases and the resultant effect is definitely arresting. In fact the relationship is symbiotic, the length allows the lines, kinks and creases to flourish while at the same time those visual relief points hide its gangliness that otherwise would have looked ugly. And therein lies a problem - all of this visual artwork is only visible in a side profile. So if you are standing at a bus stop and see the Mobilio pass you by, I guarantee you will stare at it harder and more creepily than most Indian men do at women. But watch it creep up on you in your rear view mirror and you will simply dismiss this as the Amaze. That's because the front end of the Mobilio isn't unique, it's got nearly the same accents as the Amaze - the same grille, the headlamps are identical, the only difference is the in the bumpers which look like a split type rather than the smooth continuous flowing unit on the Amaze. But let me get your attention back to the length and all that design work Honda has lavished on it. The wheelbase has been increased by 247mm, to 2652mm. Overall length, as a result has increased to 4.4 metres or precisely 4386mm. This means Honda have now been able to pack in seven seats as intended. No, there isn't a six-seater option from the time of launch, but expect that to be included in the next few months. On the flipside, the increase in length over the 4 metre bar means pricing will not benefit from the duty cuts. Now with that increase in length, Honda have simultaneously increased the length of the rear doors. It's not a visual relief thing but instead, is intended to provide better ingress and egress to passengers trying to get into that last row of seats. Clever? Well, Honda has almost all the answers for the doubters! The longer doors also need larger windows and as a result, the thing we call a greenhouse or the cabin, looks and feels roomier. This may raise some concerns about cooling but Honda have also addressed that by providing a twin set of air vents, one on the dashboard and the other on the roof, each of which has its own condenser. Like I said, Honda has answers. Now the length isn't the only alteration - the Mobilio is taller, wider and it has better ground clearance too. The height has increased to 1603mm, nearly a 100mm more than the Amaze. However, placed alongside the Maruti Suzuki Ertiga, the Mobilio is dwarfed. Having said that, there isn't a compromise on head space or roominess inside the cabin. A fair amount of profiling work done to the interior roofline has improved headroom by some margin, at least that's what Honda claim, though I couldn't tell the difference. What I could, nonetheless, painlessly identify is that at no point did the roof and my head meet. Another advantage of that increase in height is that the driver sits in a slightly loftier driving position compared to the Amaze. So you don't just look ahead at traffic, you can also manage to look down on them. 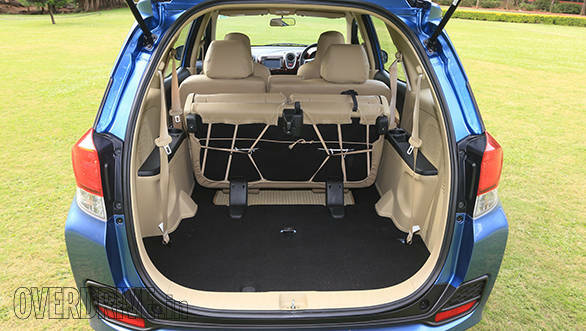 But, unlike in most other MPVs, you don't simply climb into the Mobilio, you drop down into the seat. So those with arthritis and weak knees will still feel the pinch of not having a seat at a height where you could easily walk in and out of the cabin. The width has increased by just 3mm - I'm not certain how and there weren't any answers to that, though I suspect the newly designed front doors that house the wing mirrors are to blame. Another interesting change in dimensions is that of the track. It's now slightly narrower than that of the Amaze. Though not narrow enough to alarm, I did get one very curious and hilarious answer when I raised the question, 'why?' "To improve stability at speeds." But don't you widen the track to achieve that when you increase the length of the wheelbase. A narrow track on a long wheelbase, along with raised ground clearance lifts the centre of gravity, adding to the unwieldiness of any vehicle, not adding to its stability. Now whether the vehicle is stable or not - I'll come to that, shortly. As for the embellishments, I simply loved them. The attention to detail is unlike anything I have seen in a vehicle of this order. It's meticulous and intricate and painstakingly well thought of and executed. The front end treatment is splendid but even more interesting is the tail gate which has smart lamps, a neatly integrated spoiler and two very good looking reflector units just above the rear bumper. These small plastic honeycombed units are a highly attractive touch that somehow give an otherwise boring end of any MPV a very complete look. Moving from the outside to the inside, I do believe the Honda designers paid most of their attention to the flawless exteriors thereby exhausting themselves before they got inside. In true single platform fashion, they haven't done anything to spruce up the interiors. It's got the same dashboard as the Amaze and even the seats feel the same. The second row is a 60/40 split while the last row is a 50/50 split. When unfolded, the boot space is severely restricted to just a couple of small-sized suitcases, volume is just 223 litres but fold the seats and you get 521 litres of cargo area to fill in. 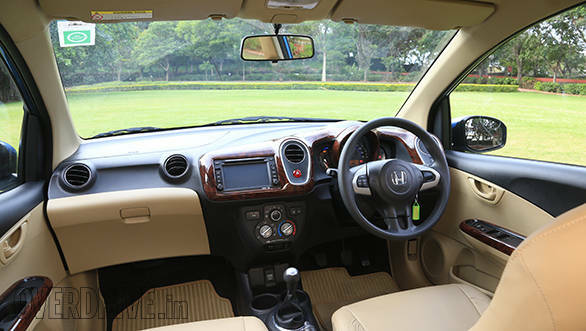 Honda has created a lot of seating space and this is a roomy cabin. It's got enough space for five full sized adults to stay cheerful on any journey, not grumpy and jostling for elbow room. The last row of seats, as is usually the case, is best reserved for under sixteens. The one thing with the seats, though, is that they lack adequate thigh support, so long distances can be exhausting, irrespective of which row you are perched on. In desperate situations the middle row slides forward by 90mm so if needed even two grown ups can squeeze into the last row with reasonable comfort. The team of engineers who worked on this car though must be applauded, because they did a smart job with a very slim yet highly effective air-conditioning vent array placed on the roof. They also very ingeniously came up with a simpler solution to folding the middle row seats to get access to the last row. With a simple but authoritative flick of the backrest adjust knob, the entire seat folds forward with a spring. Just one simple movement! One area of criticism that requires immediate attention from Honda is the quality of fitment and materials inside this cabin. Some of the plastics feel cheap, and the fittings leave a bad taste behind. For instance, the gap between the glovebox lid and the dashboard is seriously appalling. As is the quality of the plastic used there. Even the faux wood inlay on the dashboard of the top end variant is in such poor taste. I was disappointed to see what looks like an afterthought instead of a smartly selected sound system. Lesser cars have better audio systems, so why, Honda, have you resorted to this? In an effort to provide a multitude of features like a video player along with a navigation system and other frills, you haven't paid attention to ease of use. And the exposed wiring in the glove box is just poor. So yes, in many ways, this is a very good though uninspiring cabin. 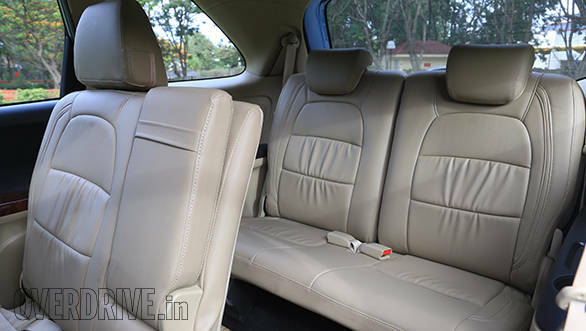 And I do hope the Mobilio at time of launch will have the interior niggles ironed out. This is a high revving engine and as the revs climb the engine note gets buzzy! On to more pressing concerns such as the engine, suspension, brakes and other mechanical areas. Under the hood of the Mobilio is the same petrol and diesel engine used in the City in exactly the same state of tune making the same amounts of power and torque. Therefore there aren't any differences either in the way they feel. First, before the diesel, the petrol is the i-VTEC 1.5-litre four-cylinder with 119PS of max power and 145Nm of max torque. 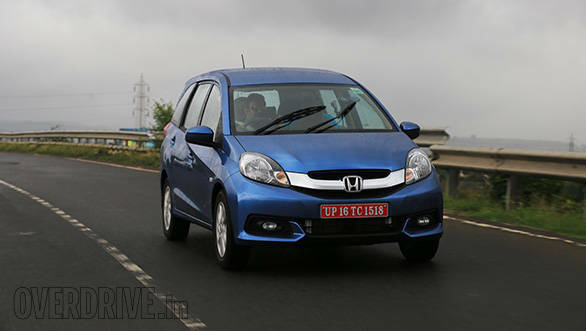 It's a bigger engine compared to that of the Brio and the Amaze. 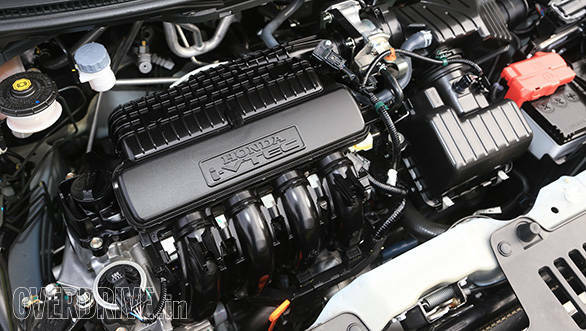 It's a silent engine and quite refined to a point because like most Honda petrols, this is a high revving engine and as the revs climb the engine note gets buzzy! Max power is made at a lofty 6000rpm and the red line is almost another 1000rpm away. 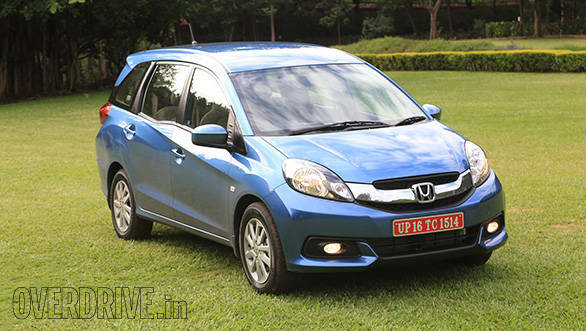 It's not a workhorse and neither is it going to move mountains for Honda. 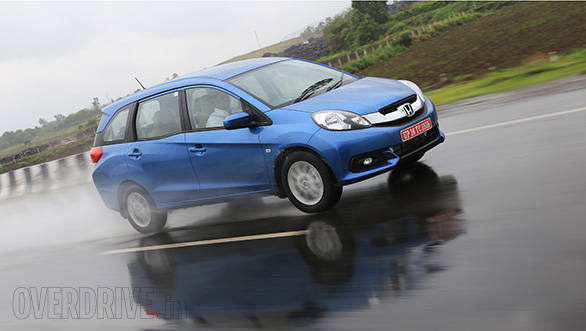 It will contribute to the overall numbers, but expect the diesel powered Mobilio to skew buyers in its favor. The i-DTEC diesel on the other hand is quite the character. 100PS max power but 200Nm of max torque gives it a decent range of performance. Interestingly, and I am driving the diesel City around just now, the engine clatter is much much louder in the City than in the Mobilio. This is because of some reworked elements in the engine to give it good NVH characteristics. Max torque in this 1.5-litre turbo diesel engine comes at just 1750rpm which is probably 200 or 300rpm above where the turbo kicks in. 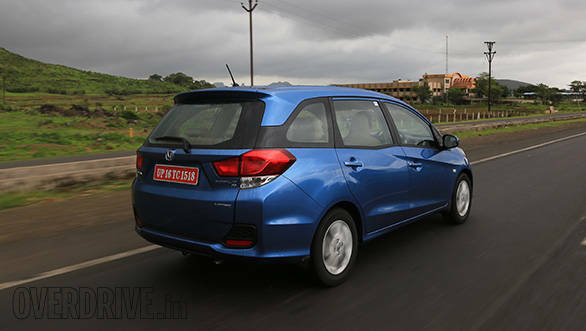 So the wave of torque very quickly engulfs this MPV and it begins moving at a quick pace in just a few seconds. Interestingly though, while in the City, top speed comes in at around 160kmph, in the Mobilio this is restricted to around 140kmph. 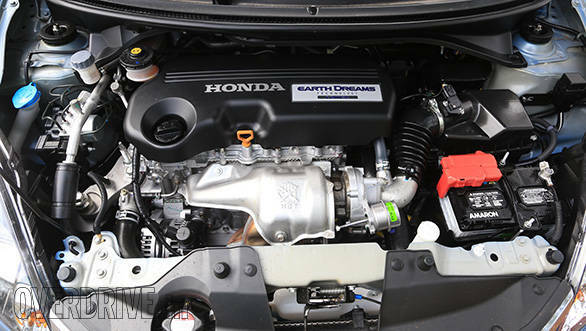 Both engines are mated to a five-speed manual transmission and there may not be an automatic version at all since Honda believe that demand for an automatic is too low. The manual transmission has been reworked with enhanced ratios to get the best efficiency possible. 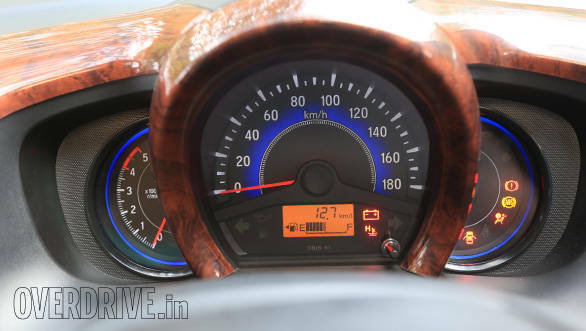 With the petrol engine, the Mobilio is claimed to provide 17.4kmpl and in the diesel the Mobilio will provide 24.2kmpl. Similar to the City, the transmission feels slick and easy to operate. The throws are light and positive and the engineering is something you will appreciate for a long time to come. And finally, the suspension has been reworked entirely to achieve two results. One is to raise the height and give it better ground clearance than the Amaze. The Mobilio has a 189mm of ground clearance which is impressive considering it's 4mm higher than that on the Maruti Suzuki Ertiga and nearly 9mm more than on the Mahindra Quanto. The second purpose is to ensure that the safety and security quotient, while the vehicle is in motion, stays high. To this end, the suspension is well composed and the body is rigid. As a result, while driving the Mobilio, the first impression you get is the very car-like feel, the weight and lumpiness of the rear end never ever manifests itself. At all times and speeds, the Mobilio sits confident and secure on its 185/65 15-inch tyres. Interesting fact, the steering effort on both the petrol and the diesel feel different. On the petrol, it feels lighter while on the diesel, heavier. This could be because of the weights of the two engines and I see no other reason for the different feel. Turning radius is also a very impressive 5.2 metres in the petrol and 5.4 metres for the diesel. That turning radius will allow you to make delicate manoeuvres without worrying about the 4.4 metre length. Under hard braking, the Mobilio felt absolutely secure. Even when the ABS kicked in, the tail end which is the heavier section in this vehicle, did not step out of line or put me at any risk. To be honest I'm terribly bored of seeing the sort of vehicles that lack innovation or use of creative talent and ingenuity. The new world order that dictates manufacturers must bring out one platform and use that to create various body styles is just such a dreary mess. SUVs feel like the sedans they were based on, which in turn feel like the hatchbacks they were based on. And into this whole inbreeding comes a new equation of the MUV or the MPV. Honda's new Mobilio to me is as interesting as asking the guy behind the counter at Subway to spice up my sandwich by lengthening it to 12 inches and adding four more slices of turkey ham. Its tasty no doubt and theres more to digest but taking it from 6" to 12" changes little else. In conclusion then, I'd like to see Honda doing something truly inspiring, I'm hoping that inspiration comes up in the Jazz! As for the Mobilio, Honda have built yet another winner taking their tally of successfully launched cars in the last 16 months to a score of three out of four. Customers will love the Mobilio and will be queuing up for it like its going out of style before its even launched Price will be an important factor to decide the outcome of this vehicle though I should say 50 per cent of the job is already done by that impressive exterior styling. All in all, that's a better than 75 per cent hit rate and clearly shows that Honda have their finger on the pulse of the nation. In these troubled times, we do need good products to improve sentiments and the Mobilio is one ray of light burning brightly at the end of a long dark tunnel.